With St. Patrick’s Day near, companies are scrambling to deliver emails to promote green-themed products, or events around the holiday. With all the buzz, it brings up a interesting question: When does it make sense for ecommerce merchants to embrace a holiday or event and incorporate it into their email programs? Sometimes a company will stretch promotions too far for a particular holiday or event. It simply doesn’t work for that brand. Other times, email promotions do a fantastic job of integrating their products into a calendar-based event and undoubtedly create excitement among their subscribers. Below, I’ll look at three reasons why a retailer should consider a calendar based email theme, and one reason not to do that. When you have products that relate to a holiday or time of year, by all means use email to promote them. Many times these products are hidden deep within your site and customers may not know they exist. Bringing them to the forefront in an email is a fantastic way to get some attention and spark a sale. Make sure that your timing is right on with your promotion. Promoting too early will simply not entice people. But promoting too late can prevent shipping the products in time for the event or holiday. For example, if you offer breast cancer products, promote them anytime there is a related event, such as a charity walk or during Breast Cancer Awareness Month in October. 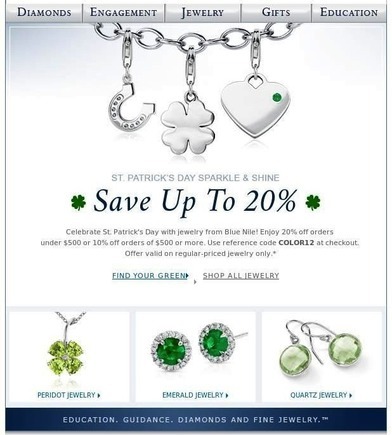 Blue Nile does a nice job showcasing their Irish and St. Patrick’s Day themed charms, which many customers may not realized they had without being featured in the email. If your site does not have products that support the holiday or event, then simply do not promote anything. Many times companies try to create products that are themed, so they have something to promote through email. This ends up looking desperate, since the email doesn’t drive the same relevancy or create the same type of excitement for subscribers. Take the email below from American Apparel, the clothing retailer. Displaying two green clothing items in the email does not convey the same impression as Blue Nile’s St Patrick’s Day Charms. It looks as though American Apparel quickly grabbed whatever green items it had, and sent the email out. This doesn’t work, especially with the odd outfit displayed in the middle that has no relevancy. American Apparel should have avoided the theme all together if it does not have the product selection to support it. Trying to force your products to fit a theme often falls flat, such as this email from American Apparel. Sometimes the objective of an email to drive consumers to a retail location. Email can be very effective in this manner. 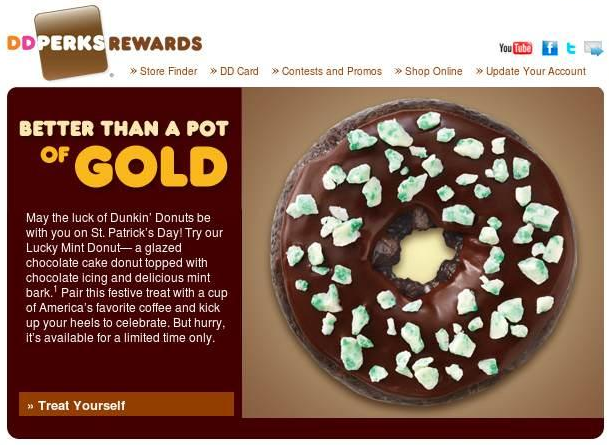 In the example below from Dunkin Donuts, we see an awareness campaign notifying subscribers that the mint donut is now in stores for a limited time. This works because it’s using email to ultimately drive consumers into retail locations. The limited time theme also creates a sense of urgency, which should help increase the response. A time limited offer related to a holiday can help drive customers to your store, such as this example from Dunkin Donuts. Using the holiday or event to drive traffic to a ecommerce site works well when the content is relevant to the site as a whole. For sites that focus on cooking, project ideas, or scrapbooking — or any other topic that ties to an event or holiday — using email is an excellent way to driving additional traffic. In the below example from Betty Crocker, the entire email is full of St. Patrick’s Day related recipes. Tying the content to that holiday will no doubt increase the typical conversion and traffic to the site. 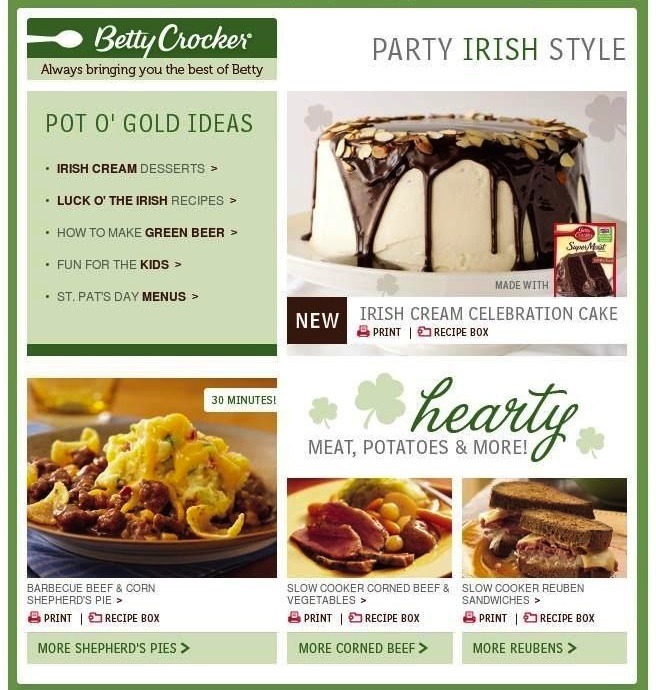 You can use a holiday email to remind customers about related products on your site, such as in this email from Betty Crocker. Using a calendar-based event or theme is a effective way to utilize new email promotions. However, make sure it works for your product and company.